The Children’s Museum of New Hampshire is a frequented destination for many families. Nearby the Children’s Museum is Dover’s city-owned Henry Law Park. The Museum and the City wanted to work together to create a playground that could serve as a destination for families. The opportunity for the park to enhance the current development of a city that provided a thriving family community in Dover was apparent to the city. The park currently is dilapidated and dowdy and consists of a fountain that is ageing with a few simple play structures. The park is split into two pieces, the upper and lower portions. The lower portion lies behind the Dover Indoor Pool, and access from the Children’s Museum to the park is limited in visibility. With nearly 100,000 visitors to the museum each year, the playground has potential for several users. The Children’s Museum faces a problem of its own because the parking lot for the Museum is located behind the pool facility, on the lower side of the park. Finding the Museum after parking a car is difficult and indirect. Terra firma landscape architecture’s first design goal was to create a visibility connection that would lead people from the parking lot to the Children’s Museum, and from the Children’s Museum (and the other portion of the park) to the lower portion of Henry Law Park. 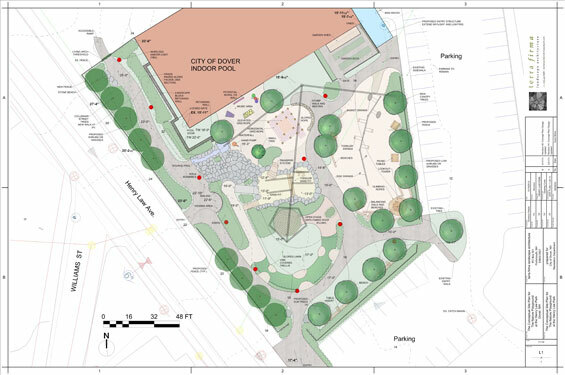 The existing play area will be completely over-hauled by this unique design, and will surely become a destination attraction for the City of Dover, especially in the presence of the Children’s Museum of NH. Working with the ambitious program generated by meetings between community groups, the Dover Recreation Department, and the Children’s Museum, particular interesting was given to the existing constraints of the site. The program called for numerous unique play stations, active natural play elements, and aesthetic considerations that responded to the Children’s Museum mission. An architectural entry skylight was proposed to connect the current stairway that leads between the pool facility buildings down to the lower park and parking lot. The skylights are designed to bring light into a presently dark and confining space. The skylight extends beyond the pool building to catch visual attention and drawn people to the pedestrian connection, which alerts users on either end that there is another side of the building to explore. 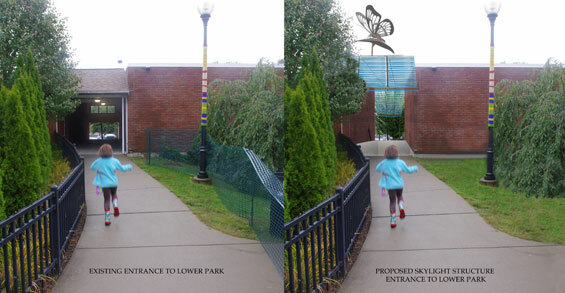 The other connection from the upper park to the lower park uses playful light poles and whirligigs to draw users through a living arch along the continuous ADA accessible walkway that winds through the park. Another goal of the design was to create as many ADA accessible features as possible throughout the park. A small extension of the walkway coming from the upper park banks off to take advantage of the higher elevation and serve as a viewing area for the entire playground. Rock scrambles, waterfall fountain features and a large semi-circular living arch greet visitors as they wind through the paths. An open fabric-roof stage sits at the bottom of a small slope to create a mini-amphitheater area for impromptu performances. A shady picnic area with benches and table inserts skirts the edge of the park, while a balancing walk that doubles as a bench wraps around a lookout tower that was designed to be reminiscent of a local Dover landmark (Garrison Hill Tower). Traditional playground features such as slides, sand pits, and swings mix with less traditional features such as musical features, climbing grid ropes, stump walks, waterfall pumps, and basket swings. Garden beds create a community area that can be used by people of all ages. The team led by landscape architect, Terrence Parker of terra firma landscape architecture, included: Tangram 3DS, ARQ Architects, IDA art installations, Altus engineering, and Summit Engineers.